This is a non-profit, informational web page, dedicated to connecting old friends. Use of copyrighted material is consistent with the "fair use" provisions contained in section 107 of the Copyright Act of 1976; the use of copyrighted material is of a nonprofit, educational nature, intended for the sole purposes of research and comment and does not significantly negatively affect "the potential market for or value of the copyrighted work(s)." 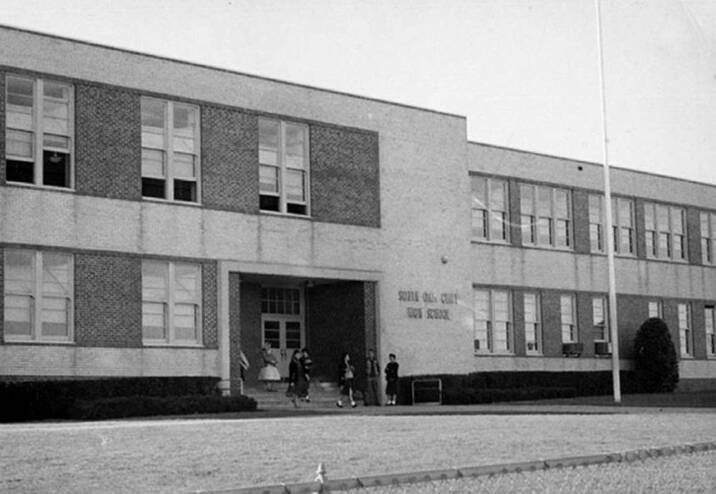 South Oak Cliff High School opened in 1952 as the first DISD high school to be constructed in almost 15 years (Lincoln High opened in 1939.) The school served developing areas of south and east Oak Cliff. In the late 1950s, before Kimball and Carter high schools were opened, it was one of the largest high schools in the city. Between 1965 and 1970 the student body changed from nearly 100 percent white to almost 100 percent African-American as southern Oak Cliff went through a period of rapid demographic change. 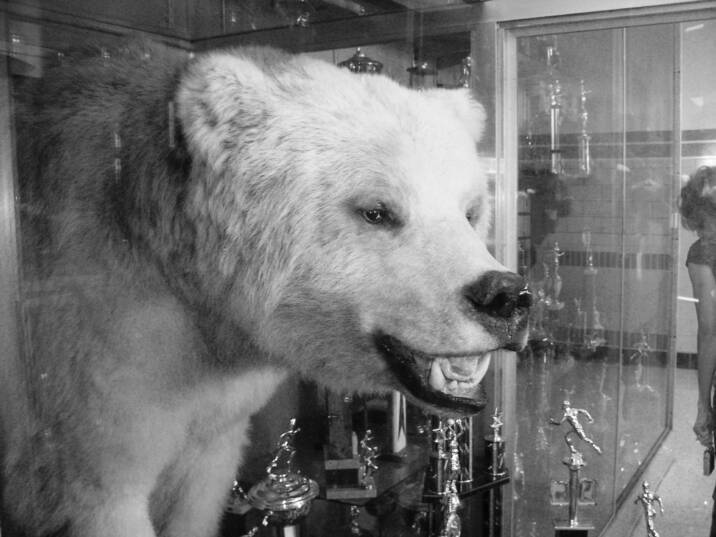 The Bear was shot by my uncle, Roland Pelt, in Kodiak, Alaska, and is, of course, a Kodiak bear. He donated the front half of the bear to SOC to be displayed as the mascot, and he kept the back half of the bear as a rug in his home office. As argued by some, this is the original bear and it is exactly as it was when he presented it to the school (never on all fours or standing up as some erroniously recall). The display was created to give the appearance of the bear walking out of his den. 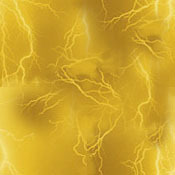 Though he has faded somewhat from his original golden color he is indeed the same bear. In fact, so much fading, that I had a lively discussion with a teacher a couple of years ago when we visited the school. She tried to tell me that it was a Polar bear. At first I thought she was kidding, and then told her the story of the Bear....but she would have none of it. Nevermind that the SOC bear does not even remotely resemble a Polar bear, snout wise or any other way, but that's what she believed. Roland, or Big Roland as the family called him, was a builder and developer in Oak Cliff. They lived off of Colorado, not far from Methodist Hospital. His wife, Stella Mae, was my Dad's sister. Roland was a Community Leader and Philanthopist in OC and Dallas and I would presume he was a member of the OCCC. The initial 100 acres of land for the campus of Dallas Baptit University overlooking Mountain Creek Lake in the hill country of southwest Dallas, were donated by John Stemmons, Roland Pelt, and Associates. Both Roland and his wife, Stella have passed on but their legacy lives on. And now you know the rest of the story. Mrs. Virginia Hurst is a new addition to the S.O.C. faculty. She is married but has no children. Mrs. Hurst attended Forest, University of California, Stanford, and S.M.U. Her favorite recreation is playing Bolivia. Miss Betty Eskrigge is one of S.O.C. 's new teachers. She teaches Physical Education and has taught at Breneau College, Gainesville. Miss Eskrigge has attended Mississippi State University, and Peabody College for Teachers. Her favorite recreations are people, swimming, tennis, bridge and most anything. Mr. Eugene Kribbs is married and has two children, both girls. He taught at Forest High School. He now teaches Mechanical Drawing. He attended Texas A&M. and N.T.S.C. His hobby is leather craft and wood work, and all types of sports, hunting and fishing, all good food. Coach Charles Hodge One of S.O.C. 's new football coaches is Charles Hodge, who works with the ends on the A squad. Besides his football coaching, he teaches general math, and will also coach B team basketball. Coach Hodge graduated from Sunset in 1948 and was tri-captain of the football team there. Coach Graham, S.O.C. head coach, saw Mr. Hodge in action at Sunset and therefore knew he would make S.O.C. a good coach. After high school, Coach Hodge went to Texas A&M. He lettered three years in football. Last year he coached elementary school football in Midland, Texas. He is married and has two boys. Marianna Brady, the first principal of George W. Truett Elementary School and moved to South Oak Cliff High School in 1952. In 1956 she became the founding director of the renowned precision drill team, the South Oak Cliff Golden Debs.